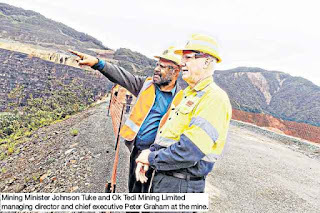 Papua New Guinea MINIING Minister Johnson Tuke has praised OK Tedi Mining Limited’s contribution to the national ecnomy and development over the years. Tuke and Department of Mineral Policy and Geo-Hazards Management secretary Harry Kore were taken for a tour of the mine last week by managing director and chief executive Peter Graham, deputy chief executive and general manager employees and external relations Musje Werror and other mine executives. “Ok Tedi has contributed hugely to the economy of this country and in these few days I have embraced myself with your entire operations in the Western,” Tuke said. Tuke was told that the mine operations did not stop at Bige or Kiunga but extended all the way down to the mouth of the Fly River in Western.